Say hello to a new family favourite weeknight recipe: tacos stuffed with cauliflower, salsa, sour cream and shredded cheese. 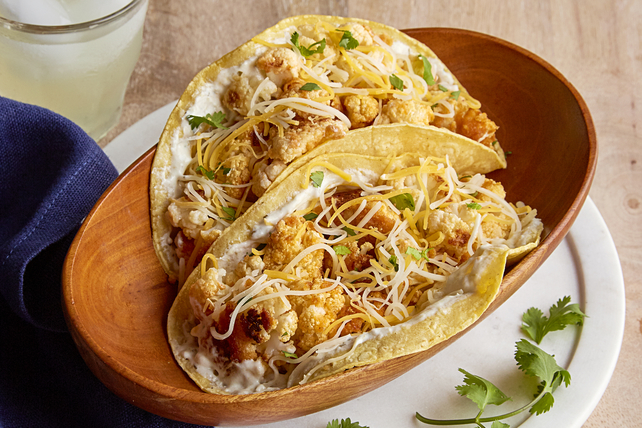 Our Tex-Mex Oven-Roasted Cauliflower Tacos are delish! Mix salsa verde and sour cream until blended. Whisk egg whites and hot sauce until blended. Add to cauliflower in large bowl; mix lightly. Add coating mix; toss until cauliflower is evenly coated with coating mix. Bake 25 min. or until cauliflower is tender and lightly browned. Spread tortillas with sour cream mixture; top with cauliflower and cheese. Fold in half. Top tacos with chopped fresh cilantro before folding tortillas in half.